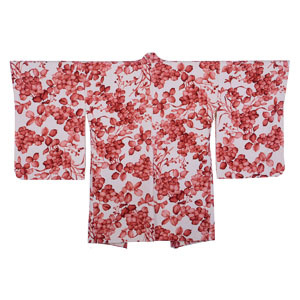 The Cherry Blossom Haori is a lovely secondhand jacket which could be worn as part of a casual or formal outfit. Condition: faint brown stains are present throughout (see images). These are noticable on close inspection but overall the jacket is lovely. Length: 80cm; Width: 60cm; Sleeve span:122cm. Fits chest up to 40" /100cm. Tacking used to keep garment seams neat during periods of storage, may be present - simply remove when ready to use.